Louis van Gaal, in his tenure at Old Trafford, has flirted a lot with the shape of his side. Sometimes forcibly due to truckloads of injuries or sometimes purely out of love for his philosophy, but the result has been a mixed bag. United players’ lack of tactical flexibility to play in a back three has been exposed innumerable times. More often than not they have ground out results rather than blowing their opponents away, whenever they have played with a back three. Tonight for the umpteenth time we saw them being uneasy with a back three. In first half, the visitors were shambolic to say the least. The three centre-halves were completely out of sync with each other and furthermore the wingbacks were no better either. Both Rafael and Luke Shaw were caught napping quite a few times. The young wingbacks failed to minimize the space they left behind every time they bombed forward. It was only in the second half when they reverted to a back four when we saw a more familiar Manchester United. The ease displayed by Tyler Blackett and Paddy McNair in full-back roles was evident as they looked more settled, especially McNair, who is naturally a centre-half. This has been United’s Achilles heel for the past couple of seasons. The Reds have been very sluggish in their build up play and have been very sloppy while passing the ball around. 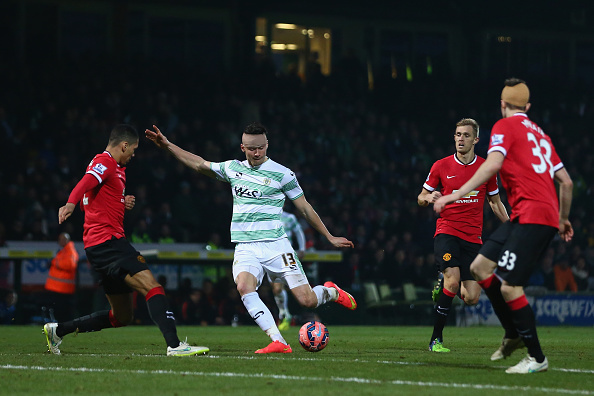 Manchester United’s sluggishness is what kept Yeovil in the game till Angel Di Maria scored the late winner. The unnecessary corners conceded were far too many especially against a direct and long-ball playing side like Yeovil Town. The high pressing tactic of Gary Johnson’s boys caught the United midfield napping in possession quite a few times. Especially in the first half where United struggled to get into any sort of rhythm. Even the more composed players like Ander Herrera and Darren Fletcher were caught in possession quite a few times. The lack of their usual nip and zip in passing was nowhere to be seen. It seemed that Michael Carrick was sorely missed tonight by Louis van Gaal as the boys in red yearned for a player who could tick the ball for them throughout the 90 minutes. The usually sharp players like Wayne Rooney and Juan Mata were also quite slow and sloppy in the middle of the park. Thankfully for Manchester United, their hosts were continuing their woeful form in this tie as well, which let them off the hook. Manchester United’s defensive woes continue to haunt them even against a side like Yeovil Town who gave them a torrid time throughout the game. The clean-sheets during such times can be quite deceiving. On paper, it is a routine clean-sheet for them, but in reality they were literally let off the hook by Yeovil Town attack. The back five with Rafael and Shaw in wingback roles were in tatters as the home side looked like they would break the deadlock and not their distinguished guests. In the second half too, Chris Smalling and Johnny Evans were far from confident. A glorious miss by Kieffer Moore and a goal line clearance by Angel Di Maria played a very important role in this win than the defensive heroics of the United defense. None of the defenders from Manchester United looked anything like their usual selves this time. Although, this has been plaguing United for quite a while now, but they were expected to put up an impressive display against a side which is sixty-four places below them in the pyramid. Alas! They flattered to deceive this time as well. Quite a few signings are expected in this area in subsequent windows if this continues over the course of the season. 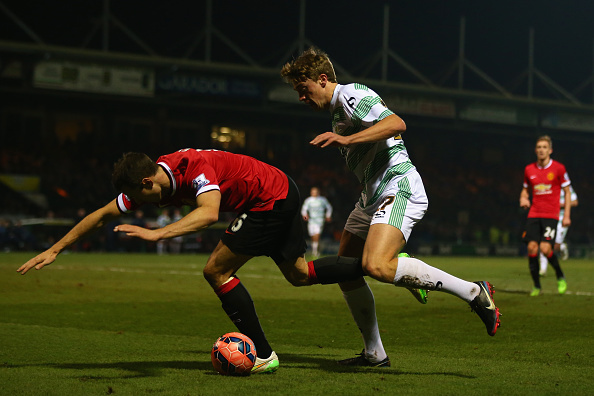 #4 Yeovil Town\'s spirited display. This game was supposed to be a washout for them, but they dug in and held their own. 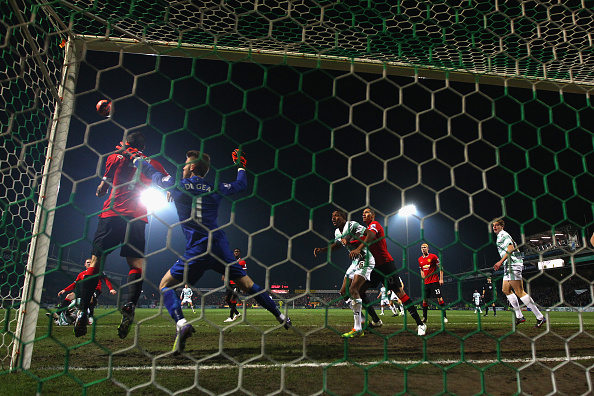 Yeovil Town are laying bottom of the League One and have been awful at home. But The Glovers kept the spirit of the FA Cup alive by making a match out of this encounter against a team lying third in the Premier League. 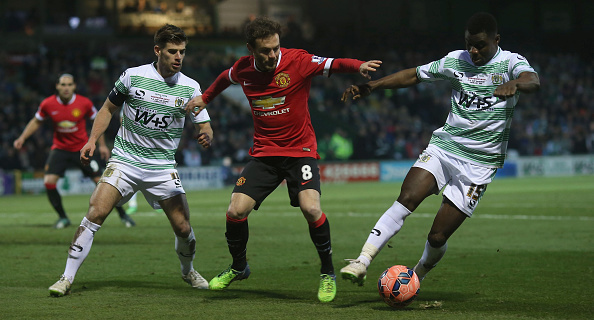 Yeovil’s high-pressing tactic pressurized a feeble Manchester United midfield and defence. In the first half, it looked like they had their opponents on the mat when United were completely out of sorts. They also had the chance to take the lead when Kieffer Moore missed a sitter. They didn’t trouble David de Gea that much, but they certainly irritated the United rearguard. Gary Johnson’s side defended with their heart on the sleeves as they held an attack that boasted names like Wayne Rooney and Radamel Falcao for almost over an hour. Their physicality unsettled the United midfield as Ander Herrera and Darren Fletcher were always either outmuscled or caught out in the possession. If only they could have scored! That’s the least they deserved for their brave display. The crowd roared on as they voraciously encouraged their boys to go for the kill but in the end they couldn’t withstand the quality of Manchester United players, which was too hot for them to handle. Nonetheless, it was a very good performance by them. 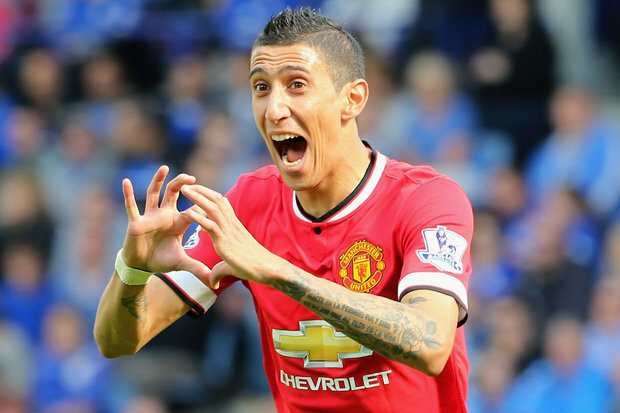 Di Maria’s return could turn around Manchester United’s season. The British record signing got the first hand taste about the essesnce of the FA cup as he made the trip to Somerset. The Argentine has been struggling with injuries of late and this seemed the perfect tie for his return to competitive football. Angel Di Maria had an eventful thirty minutes or so as he made an effort to make an impact on the game. He surely lacked his usual sharpness but was still lively enough for the home side. The Argentine made two telling contributions at the either of the pitch, which in the hindsight might have played an important role in this victory. First, he made an off the line clearance of Joe Edwards’ bullet header which seemed to be destined to nestle in the back of the net. And then in the 89th minute, he scored that crucial second goal which sealed the deal for the visiting team. United’s frontline is lacking some breakaway pace and Di Maria’s return would certainly provide the Old Trafford side with that, in abundance. He showed what he can do on a counterattack with his nimble feet and sublime ball control. His prolonged fitness could surely be the turn of fortunes for Louis van Gaal and his boys.